Various departments of the Lincoln Parish Clerk of Court handle different vital records, and they also have an online search system. The Civil Department handles all matters to do with indexing, and the Recording Department deals with such records as property and mortgage. The Clerk of Court office is on the first floor of the Courthouse in Ruston, LA, at 100 West Texas Ave.. To register for the Online Search System, call (318) 251-5130. It costs $50 per month for up to five users and $0.50 per page to print records. 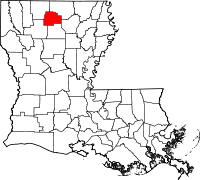 Lincoln Parish was formed in 1873, during the Reconstruction, the decade-long period after the Civil War when the northern states rebuilt much of the devastation wrought on the South. In that spirit, the parish was named after assassinated President Abraham Lincoln. As of 2004, the parish had approximately 42,000 residents.